In 2001, Van den Berghe and colleagues introduced the concept of strict glycemic control in the critically ill patient . The impact of this new approach was particularly significant when the renal outcome of the patients was evaluated. While some subsequent studies corroborated Van den Berghe and colleagues' results, others could not demonstrate any benefit of intensive insulin therapy on mortality and renal outcome. One of the difficulties in comparing the incidence of acute renal dysfunction is the lack of consensus about its definition. The RIFLE criteria, proposed in 2004 , had the objective of standardizing this definition. To compare the incidence and severity of acute kidney injury (AKI) in critically ill patients submitted to two different regimens of glycemic control, using the RIFLE criteria. Analysis of 228 patients who had been previously included in a prospective study, randomized to intensive insulin therapy (Group 1) or to a carbohydrate restrictive strategy (Group 2). The RIFLE criteria were established according to the creatinine values on the first day and the last day of the ICU stay, and the highest value obtained during this period. The renal outcome was evaluated through the comparison of the last RIFLE score obtained during the ICU stay and the RIFLE score at admission, and then classified as favorable, stable or unfavorable. The two groups were comparable regarding demographic data, APACHE III score and comorbidities. The median blood glucose levels were 132.6 mg/dl in Group 1 and 142.0 mg/dl in Group 2 (P = 0.02). Hypoglycemia occurred in 20 (18.1%) patients in Group 1 and in five (4.2%) patients in Group 2 (P = 0.001). AKI developed in 52% of the patients and was associated with a higher mortality (39.4%) as compared with those who did not have AKI (8.2%) (P < 0.001). The renal function outcome was comparable between the two groups (P = 0.37) (Table 1). 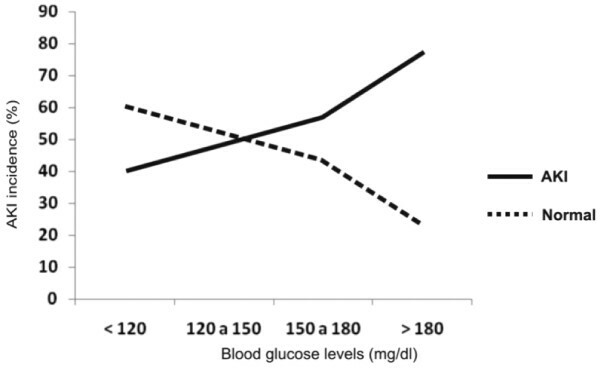 On the other hand, we have observed a significant correlation between the blood glucose levels and the incidence of AKI (P = 0.007) (Figure 1). In the multivariate logistic regression analysis, only previous diabetes mellitus and age higher than 60 years were risk factors for AKI. Independent risk factors for mortality were hypoglycemia and APACHE III score >60. Acute kidney injury (AKI) according to glycemic levels. Intensive insulin therapy does not reduce the incidence of acute kidney injury evaluated through the RIFLE criteria when compared with a carbohydrate restrictive strategy. However, we have observed that an increase in the blood glucose levels beyond normal values is associated with an increase in the incidence of AKI. This, as well as the higher incidence of hypoglycemia, suggests that a carbohydrate restrictive strategy is safer than and as efficient as intensive insulin therapy in preventing AKI in critically ill patients.